Barack Obama Overtakes Kevin Rose On Twitter. McCain Is Nowhere In Sight. Up until last night, the person with the most followers on the micro-messaging service was Digg founder and Web celeb Kevin Rose, with 56,482 other people following his every public mind burp. It took none other than Barack Obama (or, rather, Obama’s campaign machine) to take the Twitter crown away from Rose. Obama can now finally stand tall knowing that 56,791 people subscribe to his campaign Tweets. How do the two top dogs on Twitter differ? While Obama auto-follows everyone who follows him and more:59,474 people in total. I’m sure he reads every Tweet (no 2000-person limit for Presidential candidates). Rose is more stingy with whom he follows. Only 97 people—but one of them is BarackObama!. 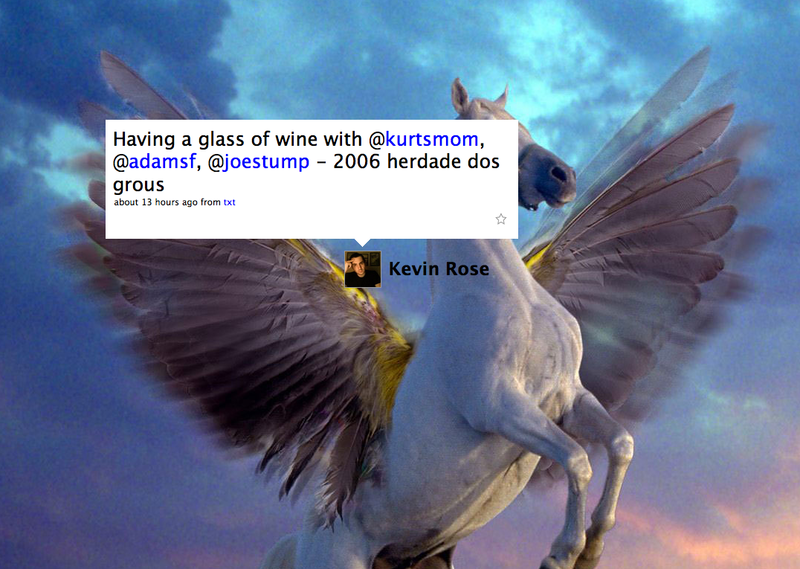 While Rose likes to tell everyone what he’s drinking (nice unicorn background image, Kevin), Obama invites his followers to sign up so they can be the first to find out who his VP pick is going to be. How about Rose? He knows how to get the vote out and seems ready for a new gig. 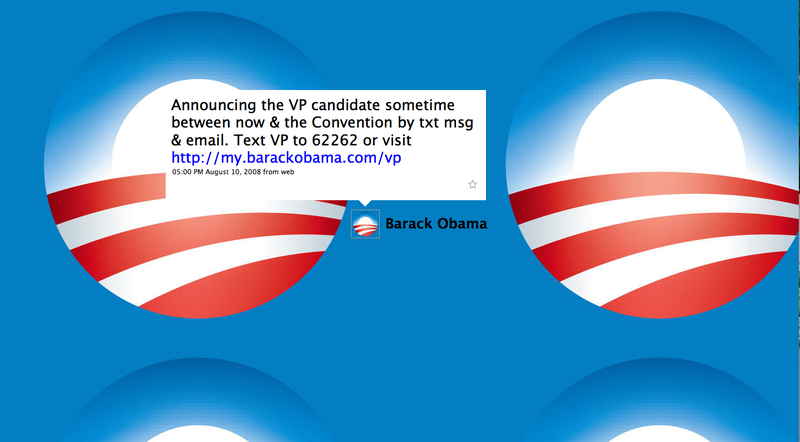 Note to the Obama campaign: you might want to change the background image from your nondescript campaign button to a picture of Obama. And John McCain? He’s not in the top 100. In fact, he’s nowhere in sight on the Twittersphere (it’s not exactly his constituency). Or at least, I can’t find him. There’s this unofficial account, JohnMcCain2008, which has attracted 1485 followers. But then, McCain doesn’t even use a computer, so you cannot very well expect him Twitter. Not that it matters. This may be the Internet election, but Twitter still won’t be a factor until at least 2012. Or will it prove to be a more powerful influencer in the elections than its early-adopter pedigree would suggest?